In linear perspective, a circle or ellipse in your (3d) scene appears as an ellipse on your (2d) canvas. Correctly placing this ellipse can be challenging however, as the center of the 2d ellipse does not necessarily match the center of the 3d circle, and you have to figure out what the degree and rotation of the ellipse should be. With this ruler, all you have to do is align the four corner control points with the projected square or rectangle within which you wish to draw circles or ellipses. The correct ellipse will be computed automatically to fit the quad! Like the Vanishing Lines ruler, this ruler is best used over an existing scene, where you can line up the quad with scene elements. But after getting used to it, it can also be a great tool on its own! Drawing concentric circles in perspective is usually tedious, as you need to adjust the ellipse center/degree/rotation for each circle. With this ruler, you don't even have to think about it! As you move your pen, the ellipse will be adjusted so that it passes through your current pen position, but keeps the original perspective projected center. This allows you to quickly draw perspective correct concentric circles or ellipses. No Key Move the corner. Slide the edge. Shift Resize the quad. Slide the edge and its opposite in symmetry. Control Slide the quad along the 3rd vanishing line. Slide the quad. Alt Slide the corner along either edge. Move the edge freely. When the corner is a right angle. When the center line is at a right angle with the edge. When two opposite edges are parallel. When holding the control key down, you get 3 additional control points: one to rotate the quad, one to move the quad, and one to toggle VP3 Edit Mode. You can also use the Move Center keyboard shortcut to move the quad. This can be set via Settings/Edit Shortcuts/Ruler Shortcuts. If you want to create cylinder or cone sections, you'll want to slide the quad along a third vanishing line (by holding control while dragging a corner point). The first two vanishing points are defined implicitly by the shape of the quad. 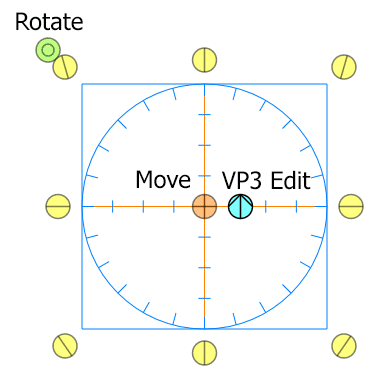 To define the 3rd vanishing point, you must enter VP3 Edit Mode by pressing control+shift, or clicking on the blue control point that appears next to the center point while holding control. While in this mode, the ruler will draw straight lines towards VP3. There are two methods you can use to set the VP3 position (press shift to toggle between them). Set the center line direction (this is the line coming from VP3 and going through the center of the circle), and then adjust the corner line. When you move the corner line, the VP3 position will move up or down the center line. 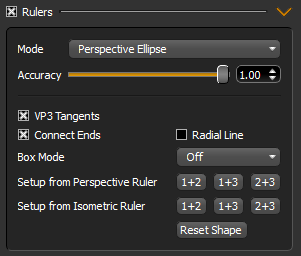 Line up the two control lines with parallel lines from your scene (just like with the Vanishing Lines ruler). Use the first method if you know where the center line is (or at least have a feeling for where it should be, if you're constructing from scratch and don't need things to be perfect). Be sure to enable VP3 Tangents so you can see the outline of the cylinder or cone. Use the second method if you don't know where the center line is, but there are lines in your scene that you know are parallel to it. To quickly jump from your current quad shape to a square and back, use the Perspective Ellipse Reset shortcut (you can configure it via Settings/Edit Shortcuts/General Shortcuts). When switching to the square, the size and center will stay the same. This will help you quickly construct spherical sections, such as this dome. When the accuracy parameter is lower than 1, checking this option will ensure that none of your original input gets mixed in towards the start and end of the ellipse. This is great when you need to add a little messiness to your ellipses, but still need the ends to connect neatly. This option enables a radial ruler connecting to the center. When enabled, you can switch between the ellipse and the radial line by tapping shift before drawing (this key can be changed via Settings/Edit Shortcuts/Ruler Shortcuts/Select Line). While drawing, you can switch lines by pressing control. When the Radial Line and Box Mode options are turned on and you switch lines while drawing, your pen will be clamped to an elliptical/circular section box defined by the angles and radial length of your first lines. If set to X-Symmetric or Y-Symmetric, the end angle will be determined when you start drawing, depending on which direction around the ellipse/circle you are going. This will help you quickly draw closed circular boxes without having to worry about overshooting.